Pocono is the Lenape Indian term for stream between mountains. Perhaps the Lenape people had a penchant for understatement because the stream is the sizeable Delaware River and the Pocono mountains in winter offer decent-sized ski areas in Pennsylvania, not like big Western ski resorts but enough skiing to satisfy your family for a day or a weekend ski trip, and great learn to ski programs. The skiing in Eastern Pennsylvania, while not as good as New England Top Ski Resorts or a Family Ski Trip out West, are worth attention – above and beyond the honeymoon heart shaped tubs that have made this region so famed among brides and grooms. The Pocono areas have really pumped up their snowmaking in recent years, and they cater to families learning to ski or snowboard with the best learn to ski and snowboard programs, along the latest terrain park features. If your kids are anything like ours, they like their slopes sprinkled with hits, spines, rails and rolls (see our ski slang translation) – they will find generous portions of halfpipes and parks in the Pocono Mountains, as well as tubing parks. Big Boulder was the first commercial ski area to open in Pennsylvania in 1946. Downhill skiing has evolved dramatically in the 70+ years since, and while the Pocono slopes haven’t become any more precipitous, the facilities now include high-speed lifts, grooming and snowmaking, and terrain parks to keep up with the latest slope styles. And Big Boulder is great for little kids. Its trails are well-manicured trails, the ski schools have experienced instructors and mascots like Snowball the Snowtiger are frequently spotted on the slopes pressing their furry flesh to make kids smile. 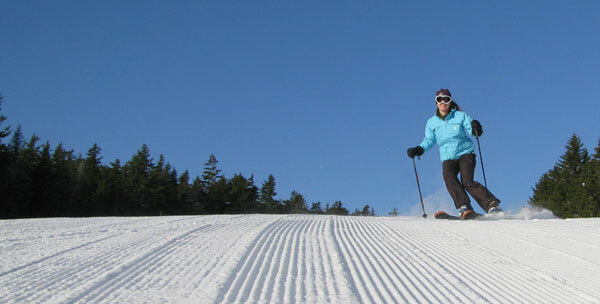 Big Boulder is now owned by Peak Resorts, sister resort to Jack Frost, Attitash, Wildcat and Crotched in New Hampshire and Mount Snow in Vermont. Shawnee Mountain Ski Area in the heart of the Pocono ski region has plenty of lifts (a quad, a triple and 6 double chairs) to get you up the 700-foot hill for skiing and riding on 23 trails, covered 100% with snowmaking. Excellent ski and snwobaord rentals and learn to ski programs. A 3,000-foot-long terrain park with music gives teens plenty of room to rock on their boards. Shawnee also offers a six lane-tubing hill. Alpine Mountain is near Shawnee with has a very family-friendly Penguin Play Park for the littlest tykes. Alpine has 21 trails with a 550-foot vertical drop, features a terrain park and half pipe plus a tubing hill open day and night. Camelback is the largest Pennsylvania ski area, and also the best for families, with 33 trails and 13 lifts including two high-speed quads. All of Camelback’s 800-foot vertical is lit up and open for night skiing too. Jack Frost, aka JFBB – Jack Frost Big Boulder, an hour from Phillie in teh Poconos, is an intermediate ski mountain (600’ vertical feet) with pleasant cruising. Like Peak sister resort Big Boulder, which shares its management, its very family oriented. Jack Frost offers three terrain parks loaded with hits and happening events. Jack Frost also offers snowboarding, terrain park features and snow tubing. This is a Peak Resort, sister ski resorts, on the Peak Pass, with Attitash, Wildcat and Crotched in New Hamphire, Mount Snow in Vermont and Hunter in New York . Blue Mountain is the highest of the Pocono ski areas with 1,082-foot vertical and 30 trails served by 10 lifts, plus two terrain parks. To encourage young families to get started, Blue actually offers free childcare midweek (non-holiday), or a nominal $2/hour on weekends and holidays. Great ski lessons and rental equipment. Liberty Mountain near historic Gettysburg has modest skiing and snowboarding, plus Boudler Ridge tubing and ice skating on the centerpeice Alpine Courtyard Skating Rink. Affordabel rentals and lesson programs, and a resort Salon and Day spa on premise for the non-skier. Roundtop Mountain resort is near the state capital, with beefy snowmaking, just enought trails and lifts, and a tubing park, in Lewisbberry PA. Seven Springs Mountain Resort in western Pennsylvania’s mountains is easy to get to off off the Pennsylvania Turnpike, Seven Springs Resort is the state’s largest four-season family resort and winter adventure headquarters. Hidden Valley Resort is not so hidden, but its a gem of a winter destination for families with perfectly contained 110 skiable acres, with 26 trails, two terrain parks and a top notch learn to ski and snowboard. All these ski areas are totally geared to newbie skiers and young families; many are equipped with on-site daycare, rental equipment and ski schools for learning kids and adults. These ski areas all make snow, like churning out ice cream, to provide consistent conditions – since Mother Nature is so darned mercurial these days. There’s plenty to do if you don’t downhill ski during Pocono winters. You can ice-skate across area lakes and ponds, explore the rolling countryside on snowshoe or cross-country skis, or just sit back and relax during a horse-drawn sleigh ride. This winter playground is a drive to destination for tens of million major metro regions, so you can pack up the car and drive to your week of winter play (read: no airfare required). The scenic snow-covered hills are an easy change of pace from the usual rat race. Think of it as a second honeymoon – on snow, with the kids in tow!